Roast chicken is in every omnivore cook’s repertoire, and there are as many ways to prepare it as there are cooks. My version has evolved over the years. There are elements that I tweak every time I make it, and other elements that are Never to Be Altered under pain of (my) death. One of our NTBA (see above) aspects of this meal has nothing to do with poultry. 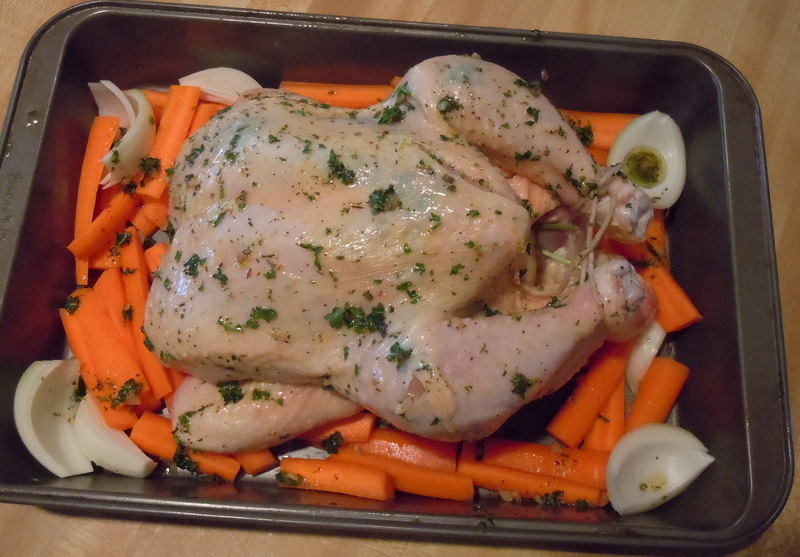 I am required at all times to roast the chicken on a bed of carrots. I can add quartered potatoes and onions, but the carrots must be there, and there must be a boatload of them; I usually cook ten to twelve carrots for the three of us. 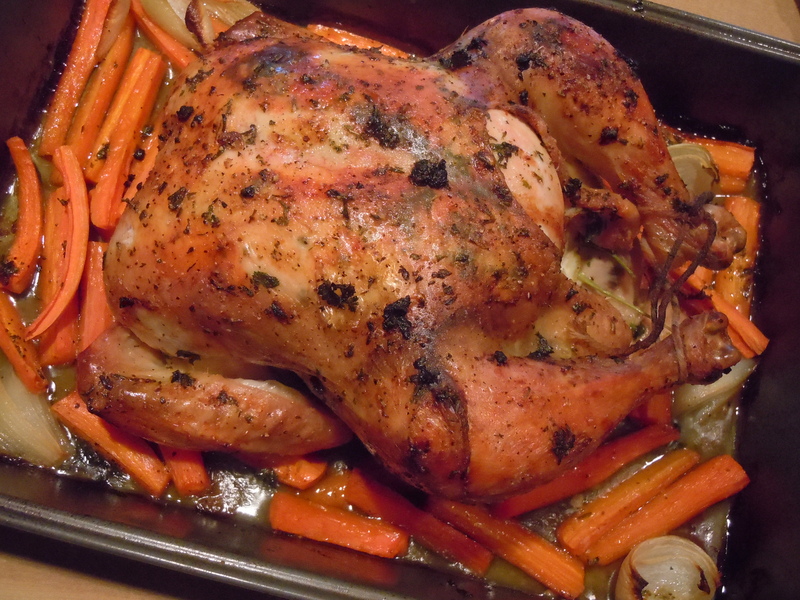 Carrots roasted along with a chicken are unbelievably sweet yet still savory and earthy. As they shrink during roasting, the flavors concentrate. They have a lovely melty, slightly chewy texture; soft but never mushy. The other NTBA element comes after the chicken is out of the oven, and that’s what we call the Drizzle. It’s more commonly referred to as a pan sauce, intensely flavored and more concentrated than gravy. It picks up the umami flavors of the chicken, the grassy notes from the herbs, and a hint of sweetness from the carrots. Leftover drizzle (if there is any) is a great base for pasta the next day, with the leftover chicken (there are never leftover carrots). To give the drizzle a running head start, I pour just enough chicken stock and/or white wine to barely cover the bottom of the pan the chicken will reside in for the duration of the roasting process. I do this at the last minute, just before the pan goes in the oven. The liquid keeps the chicken moist and the carrots from completely drying out. It does, however, prevent the skin on the bottom of the chicken from browning, so if maximum quantity of crispy golden skin is your goal, skip the liquid. You may need to take the carrots out early, though. Elements that I’m allowed to play with include the herb rub. I like to mix minced garlic with some olive oil, add herbs, salt and pepper, and rub it all over everything in the pan. When they’re available, I use fresh herbs; if the cold months are upon us, I use dried. I like a mix of herbs (basil, thyme, marjoram, chives, parsley), but you can certainly make one herb the focus. Sometimes I add a minced shallot to the mix, or a splash of lemon juice, or a pinch of Aleppo pepper. I rub the oil-garlic-herb paste under the skin of the chicken, on the outside of the bird, and any leftover oil I massage into the carrots. The skin comes out crackling with herby, garlicky goodness. When the chicken goes in the oven, I drop a knob of butter in a small dish on the counter. By the time the chicken is out and resting, the butter is soft and ready to be mashed into submission with some flour to create a beurre manié, an uncooked butter-flour paste that’s great for thickening sauces. The leftover chicken meat can morph into an endless range of dishes. Everything else goes into a stockpot at the end of the meal, for some lovely, deeply flavored roasted chicken stock, which you can then use for the next roast chicken. Ah, the circle of life. 1 chicken, 3 ½ to 4 ½ lbs. Heat the oven to 425°. 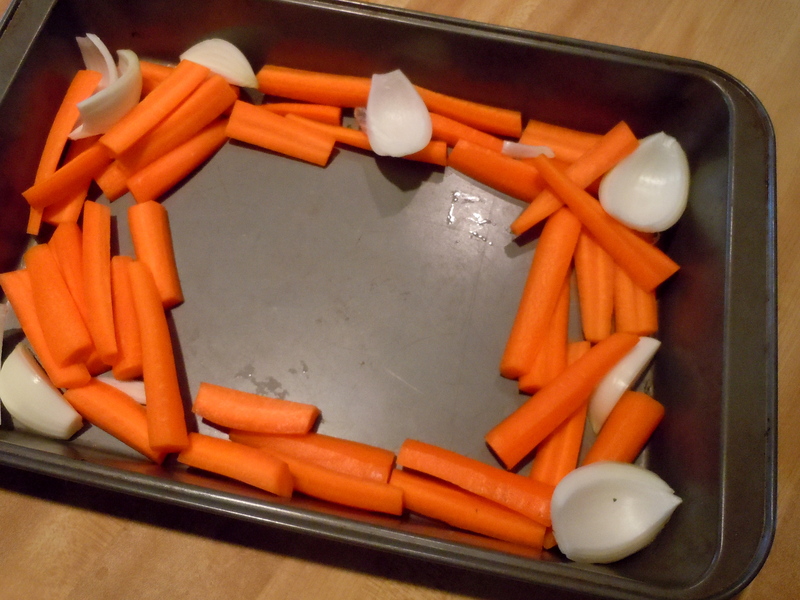 Peel the carrots, cut in half crosswise, and cut any really thick pieces in half lengthwise. Scatter the carrot pieces and onion quarters around the inside edges of a 9×13-inch metal baking pan or an ovenproof 12-inch skillet. 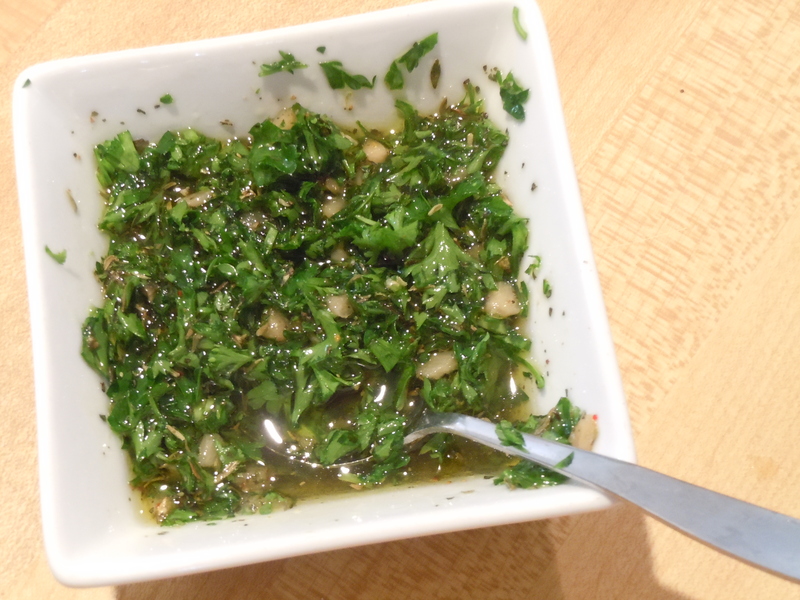 In a small bowl, mix the oil with the garlic, herbs, parsley, salt and pepper. Rinse the chicken, discard the giblet packet if there is one and trim any excess fat. Pat very dry with paper towels. Slide a finger underneath the skin to loosen it as far as you can go, trying not to rip the skin. Scoop up a little of the oil/herb mixture and rub it on the meat under the skin. (Did I mention this is a messy dish to prepare?) Do this on both sides, getting the herb mixture in contact with as much meat as possible. Rub more of the herb oil over the entire outside of the chicken. Stuff the cavity with the lemon half, if using. If you have any leftover herb stems, put them in the cavity as well. Tie the legs together with kitchen twine. Place the chicken breast side up in the pan; the veggies should be mostly around the sides of the chicken. Sprinkle the chicken with a bit more salt and pepper. Drizzle any extra herb oil over the carrots and onion, and massage it into them. Pour in just enough stock or wine to barely cover the bottom of the pan. Roast the chicken until a meat thermometer reaches 170°F, or until the juices run clear when the chicken is pierced. Remove the chicken and veggies to a platter; cover with foil to keep warm. In a small bowl, mash the butter with the flour to make a paste. Put the roasting pan on the stove over medium-high heat (this is why you had to use a metal pan). Skim off some of the fat and discard. Add most of the remaining stock (and/or wine) and quickly whisk in half of the beurre manié (butter-flour paste). Bring to a boil, stirring. Cook for a few minutes; taste and adjust seasoning if necessary. You want the sauce to be rich and flavorful, and a bit thinner than you want it—it’ll thicken up a little more when it’s off heat. Whisk in more beurre manié or stock as needed to reach a happy balance. Pour into a bowl or old-fashioned gravy boat and serve with the chicken. We like a loaf of ciabatta or a baguette to soak up the drizzle. When dinner’s over, strip any leftover meat from the bones and pack it up for leftovers. Dump everything else—bones, skin, fat, extra onion, drizzle, or even a stray carrot—into a stockpot. Toss in a bay leaf, cover with cold water, and simmer for a few hours for some fantastic stock. This entry was posted in main courses, meat, poultry,and fish and tagged carrots, chicken, roasted chicken, whole chicken. Bookmark the permalink. 5 Responses to The circle of life, chicken style. Nicely laid out! I like the process photos a lot. Currently crockpotless, we maintain a large bag of chicken- and other vegetative trimmings in the freezer for large quantity, less frequent stock making. Thanks, Bruce! The family is getting used to my little Nikon point-and-shoot on its KMart tripod living in the middle of the kitchen counter. Your stock method is great—composting for proteins, and like soil composting, with equally wonderful results.